Preheat oven to 325 degrees. Grease 3 8-inch pans with cooking spray. Add about 2 tablespoons of flour into the first pan. Coat it with flour and tap excess out into the 2nd greased pan. Add another tablespoon of flour and coat pan with flour. Tap the excess flour out into the 3rd pan. Add more flour if necessary. Discard any excess flour from the third cake pan. Set aside. In a large mixing bowl, add in the peanut butter, butter, granulated sugar, and brown sugar. Beat on medium/high until creamy. Add in the vanilla extract and eggs one at a time. Beat each egg until incorporated before adding another. Scrape down the bowl. Beat in any egg that was not already incorporated. In a separate bowl, add in the flour, baking soda, baking powder, and salt. Stir to combine. Measure out the buttermilk and sour cream. Alternately add the flour and buttermilk/sour cream always starting and ending with the flour. I did 3 parts flour and 2 parts buttermilk. Scrape down the sides and mix to combine. Divide the batter out evenly into the three prepared pans. Place into a preheated oven. Bake for 45 or until done. Mine took 48 minutes, but it can vary. Use the toothpick test if you're unsure. If the toothpick comes out clean or with moist crumbs, it's done. Batter means let it bake longer. Turn the cakes out onto a wire rack to finish cooling. They'll need to be completely cooled to build your cake. In a large mixing bowl, add in the butter. Beat until smooth. Add in the powdered sugar and cocoa powder. I sifted my cocoa powder because it tends to be lumpy. Beat until incorporated, but very thick. Add in the vanilla extract and heavy cream. Beat until everything is incorporated and beat an extra minute for a whipped frosting. In a microwave-safe mixing bowl, add in the milk chocolate chips, heavy cream and peanut butter. Microwave for 30 seconds and stir. Repeat microwaving and stirring until thick and creamy. Let it thicken up. It should still be a pourable consistency. If it becomes too thick, microwave for 15 seconds or so. Place the first layer of cooled cake onto the cake plate. Add a thin layer of chocolate frosting. Spread out evenly. Sprinkle half of the chopped peanut butter cups onto the chocolate frosting. Spread them out. Add the next layer of cake. Do another thin layer of chocolate frosting and the last of the peanut butter cups. Add the last layer of cake. Give it a press and make sure the sides line up. Frost the cake with the remaining chocolate frosting. 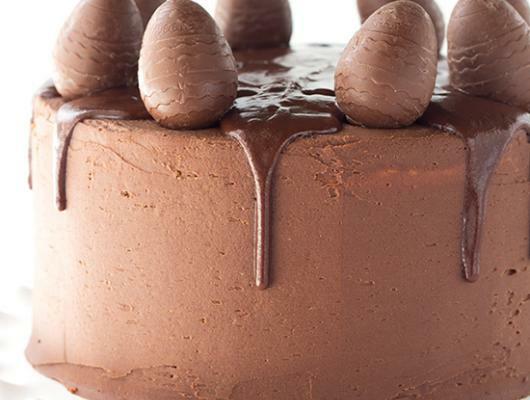 Add the Reese's peanut butter eggs to the top of the cake. Pour the ganache in the center of the top of the cake. Give it a little help to pour down the sides to have a nice drip. Peanut Butter Cake with Chocolate Frosting - peanut butter cake filled with chocolate frosting and chopped peanut butter cups. 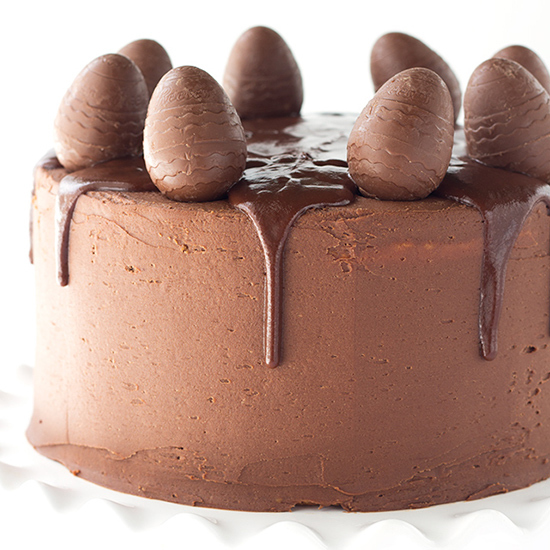 Top this cake with a chocolate peanut butter ganache and cute peanut butter filled chocolate eggs for EASTER!